Attractive Woodcock tie with birds in flight motifs on a lightly checked pattern burgundy background. One of our countryside collection. Snipe in flight stitched bird motif tie on plain background. This novelty tie theme is available in two colours. Falcon Necktie. 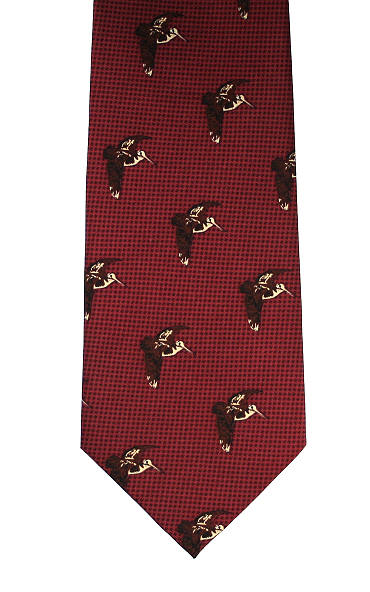 Majestic standing falcon stitched motif on plain tie. Available in green. You may be lucky and even find our friendly staff in the office on a Sunday occasionally too! We accept all major credit and debit cards. We also accept payment via Paypal for those who have an account. If you prefer to pay via telephone please ring us on the number above and we will be happy to take the details.